You been on Instagram lately? You completely green eyed of all those lucky enough to make it to Quilt Market in Houston? Me too! Thankfully, Amy of Amy's Creative Side fame came up with the Blogger's Quilt Festival a few years ago so that all of us mere mortals wouldn't feel that we were missing out completely! I've only been blogging since earlier this year and didn't have anything to enter in the spring festival and to tell the truth I feel as if I'm aiming a little high entering this year but what the heck - it's only a little bit of fun. Cara's quilt is only the third quilt that I've pieced by machine, second quilt that I've quilted by machine and third quilt that I've actually finished! Taking this into consideration I think that it would be silly of me to enter it into any category where the piecing/quilting would come under scrutiny but there is a category for Quilt Photographer and although I'm under no illusion that I'm a photographer (I take all my blog photos on my phone) I happen to think that the setting that I chose for my quilt shoot is pretty special so I'll give it a shot! And I was lucky enough to get a pretty beautiful day! Last year my brother decided that he wanted to start farming. Luckily for him we were bought up on a farm and although my dad had been renting the land to someone else for the last fifteen plus years it was possible for my brother to take over the lease. 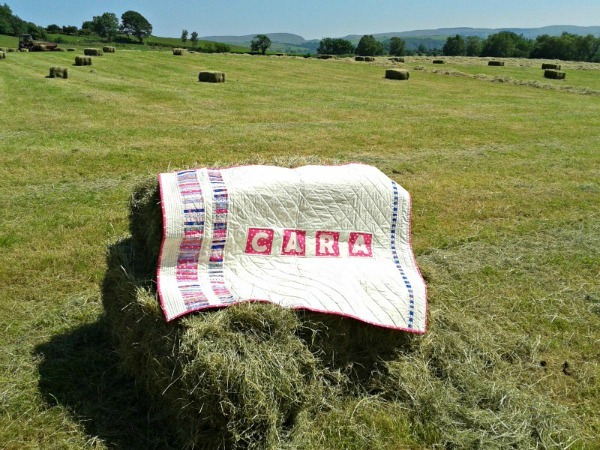 So when he asked my husband if he could help out with the hay making we all went up as a family and whilst Endaf and Anwen were helping load the bales onto the trailer (or maybe Anwen wasn't helping as much as hindering) Marged and I took Cara's quilt for a little walk around the farm. It was a beautiful day, boiling hot and the sun was high in the sky and shining brightly - maybe a little too brightly for a quilt photo shoot but undeterred I soldiered on and looked for slightly more shady spots. But the direct sunlight was still finding it's way to the quilt. 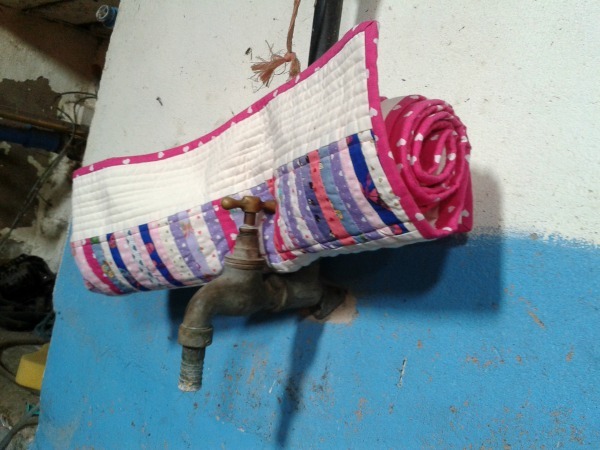 and found that the tap was really handy for holding a rolled up quilt! 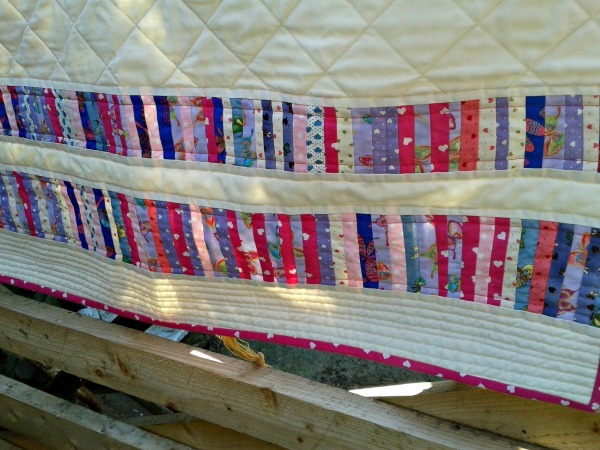 Then went back outside and got another close up showing a little of the piecing and the quilting. 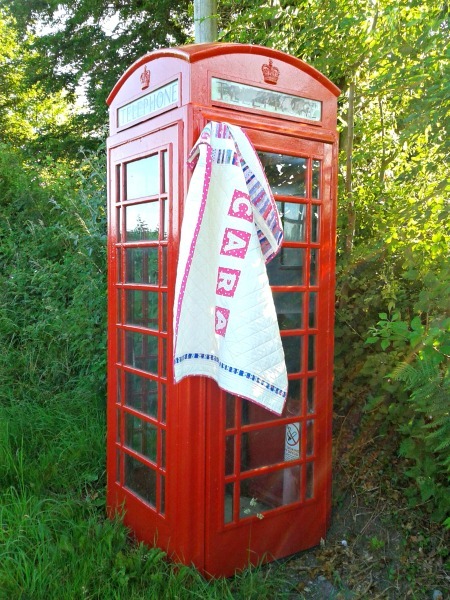 And after the love that I got for this prop last time we stopped to make a phone call on the way home! 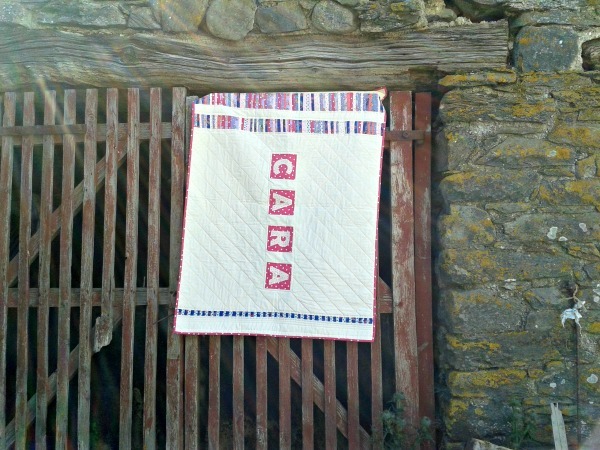 So there you are - a little wander around my childhood home complete with quilt picture overkill! Quilted - by me on aforementioned Brother. The bulk of the quilt was quilted using a crosshatch design that I marked out first. and then I added a little organic straight line quilting. - quilted using mainly Coats 100% cotton in cream with a little Gutterman in pink thrown in. Please remember to pop over to Amy's and visit some of the other blogs that have entered the festival. 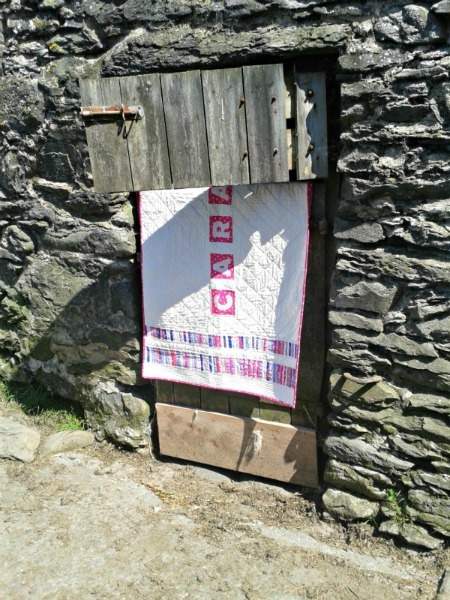 Great location for quilt photos Catrin, your brother should be renting it out :) Your quilt looks wonderful too. 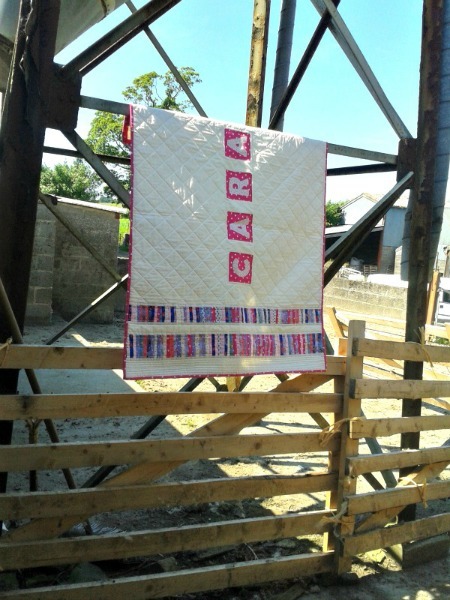 Lovely photos Cathrin, showing off the wonderful quilt! It got a lovely tour there! 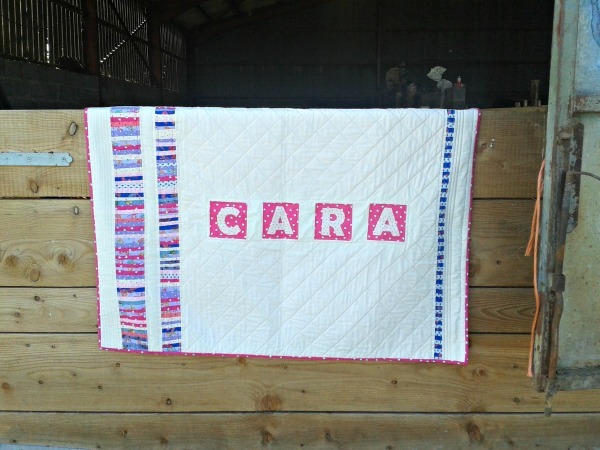 Sweet little quilt - and great photos! 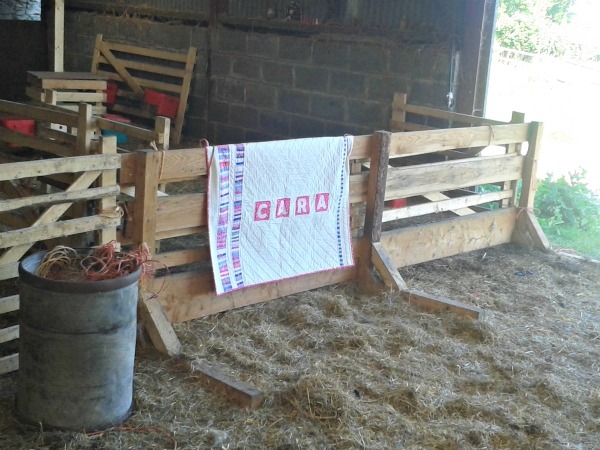 I really like the photo of your sweet little quilt on the hay bales in the field. What a great shot! 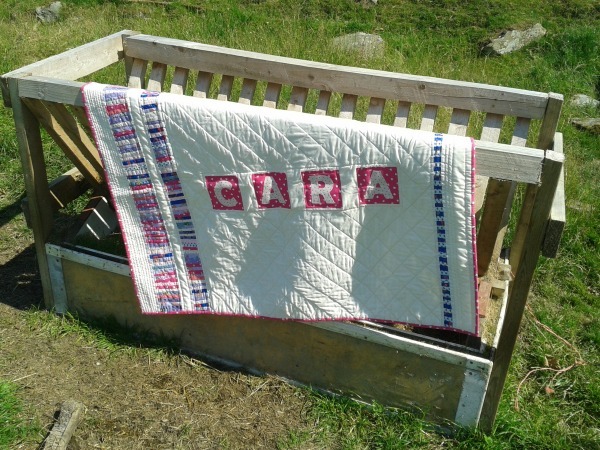 Your quilt is wonderful, keep up the great work. Thanks for a trip around your beautiful courner of the world. Love the setting for your photos! They turned out great! It was fun to see the piecing on your quilt up close, too. It is beautiful! That tap picture is precious! Right out of a magazine! 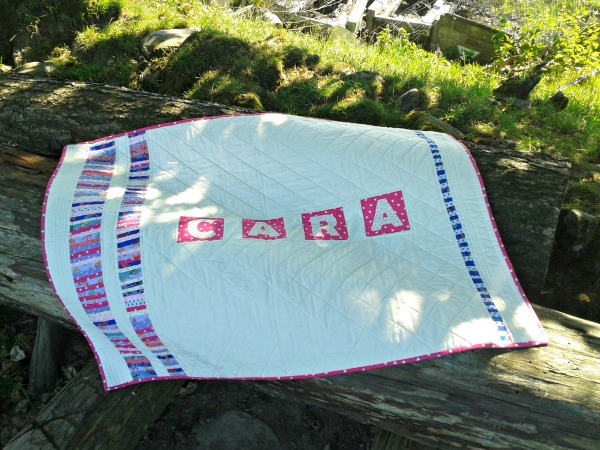 Beautiful shots and a gorgeous quilt for cara! The crosshatch quilting looks great! 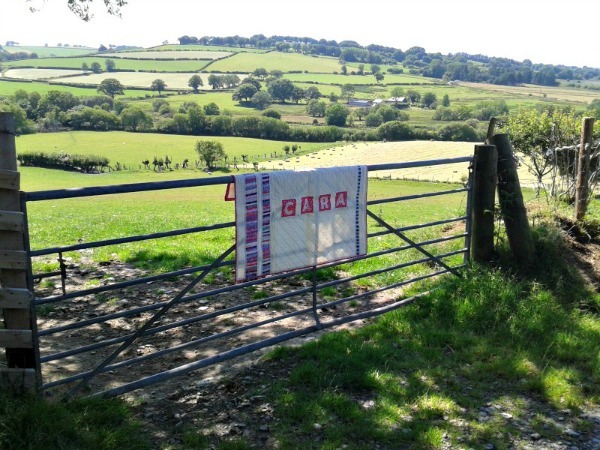 Beautiful quilt and photo's - great job. Your photos are wonderful, as is the farm. 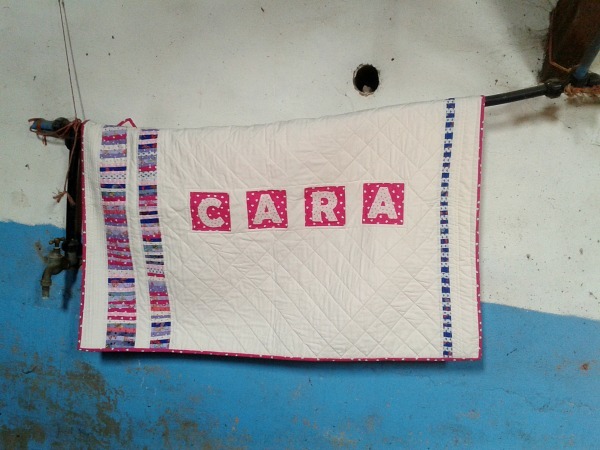 Your quilt is lovely, cheerful and fun.